What better way to bring in the summer than with a lightly dressed and mildly spicy summer vegetable pasta dish with italian sausage. This dish will thrill your residents with traditional flavors and fresh comfort, bringing the excitement with the warmer weather and summer showers. 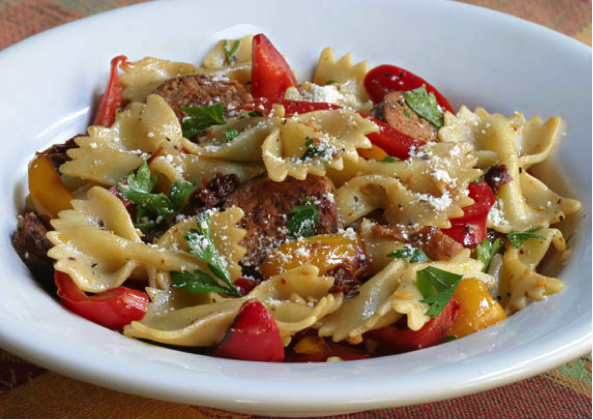 Traditional spicy italian sausage and fresh vegetables bring this dish together. Simple enough to enjoy, flavorful enough to love. This dish will be a winner all summer long. • Meanwhile cook pasta to al dente and drain and reserve. • Brown sausage in tilt skillet with olive oil on high heat and then remove and reserve. • In remaining oil, sauté zucchini, onions, and garlic until golden. • Deglaze with wine and lemon juice. 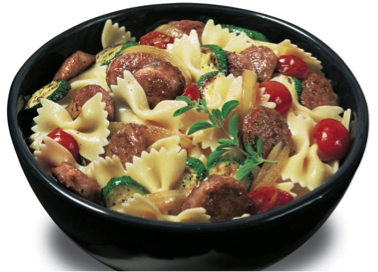 • Add remaining ingredients, as well as reserved sausage and pasta, stir gently to combine. • Season with salt and pepper to taste and heat to full temperature, and serve garnish with sprig of parsley. Italian sausage comes in a wide variety of flavors and shapes; here we use spicy pork links, although a mild chicken sausage could be substituted for a more health consious option. Also, you could substitute a bulk ground sausage for a cassarole style dish. 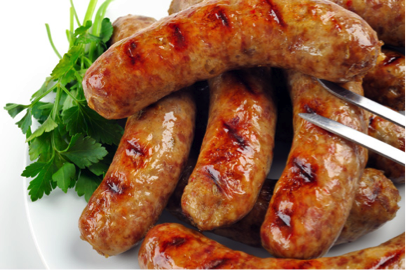 See what options are available from your vendors for special sausage flavors. Common vegetables, zucchini and cherry tomatoes, bring fresh flavor and year round availability to this dish at a budget friendly cost. Healthy produce options lightly sauted and seasoned are a grat alternative to frozen or canned products. The pasta shape is well suited for a loosely bound summer dish. Farfalle cooks quckly, and hold up well when cooked to a al dente. This recipe will yield aproximately 40 4oz. pasta portions with 2oz of sausage and 3.5oz of vgetables. Serve sprinkled with parmesean cheese and a sprig of parsley or thyme for a colorful all in one meal. The creation of simple yet elegent menus can be aided by dietary management software; this allows the analysis necesarry to create nutritional yet flavorful dishes that remain cost effective. Also by having dietary management software your information is organized in a more efficient and streamlined manner allowing your chefs more time to create, improve and train their cooks to enhance guest satisfaction. Click here to contact us!